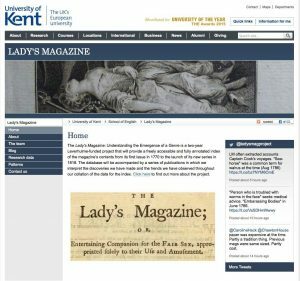 ‘The Lady’s Magazine (1770-1818): Understanding the Emergence of a Genre’ is a two-year project funded by the Leverhulme Trust Research Project Grant scheme. The team of academics behind it is based at the University of Kent and is led by Jennie Batchelor, who works closely with the project’s two full-time Postdoctoral Researchers: Koenraad Claes and Jenny DiPlacidi. Our aim is to shed new light on one of the first and longest running women’s magazines of all time. In an 1840 letter to Hartley Coleridge, Charlotte Brontë wrote that she wished “with all [her] heart” that she “had been born in time to contribute to the Lady’s magazine,” a periodical that ran for 13 issues per annum from more than six decades and had an estimated circulation of 10,000 monthly copies at the height of its popularity. 170 years later the history and cultural and literary importance of a publication, the vast majority of the original content of which was produced by unknown and unpaid reader-contributors, remains undocumented. What effects might an understanding of the magazine’s content, production, and circulation have upon our conceptions of Romantic-era print culture? What role did the Lady’s Magazine play in the long-term development of the women’s magazine and the history of women’s writing? In response to these questions, we are producing an open-access fully annotated, downloadable index of the magazine’s content for its first 50 years, which will launch in September 2016. Titles of articles are accompanied by the names or pseudonyms of their contributors, and their contributors’ status (author, translator, extracter, or pilferer) is given wherever it can be clearly ascertained. Attributions are made where possible. In fact, we are amassing a small but growing body of evidence about a number of regular and mostly unknown contributors to the magazine and their lives or careers beyond its pages. We regularly publish about these discoveries, and many other topics besides, on our project blog. In addition to illuminating the production and composition of the magazine, we also pay detailed attention to its diverse, text-based contents. Since the titles of articles in the Lady’s Magazine are often misleading (an article purporting to be about women’s dress might make an impassioned plea for reforms in female education, for instance), our index tags content by genre, key stylistic features and prominent keywords (marriage, education, politics, for example) making it easy for readers to find items of particular interest. We are mining the data we are collating and will be presenting our findings in the form of web, book, and journal articles on attributions, the career profiles of magazine contributors, and statistical and interpretive analyses of the shifting content of the magazine over the course of its long history. Jennie is also in the process of writing a book about the magazine’s place in the Romantic literary marketplace. By making the annotated index of contributor signatures and content analysis freely available online, we also hope to promote further research by scholars and other interested parties on the Lady’s Magazine, late-eighteenth-century periodicals, and authorship and print culture in the period more generally. One of the greatest joys of the project has been disseminating and talking about our research in progress via our Twitter feed, Facebook page, and blog, all of which are regularly updated. Through social media, we have entered into conversations about the magazine, its diverse content, and the issues it debates and generates with modern-day readers all over the world. Establishing a community of interested parties who felt they had a stake in the publication was vital to the success of the Lady’s Magazine, whose readers and subscribers were also its authors. We like to think that, in a small way, the online community that has grown around the project captures and perpetuates something of the spirit of the magazine itself. It has certainly been a genuine and generative collaboration that has advanced the project in ways that we could not have anticipated when we began. For instance, Jennie’s happy acquisition of a copy of the periodical from one of our blog’s readers, which contained a number of rare surviving embroidery patterns, led to a flutter of Twitter excitement that snowballed into ‘The Great Lady’s Magazine Stitch Off,’ a non-competitive sewing bee in which dozens of people all over the world have recreated 10 Lady’s Magazine patterns for display at an exhibition at Chawton House Library to commemorate the 200th anniversary of the publication of Jane Austen’s Emma (1816), a novel whose hero and a major plotline are taken from a short story in the Lady’s Magazine. This entry was posted in Collections, Digital Humanities and 18th-Century Studies, Women's Lives in the 18th Century and tagged digital humanities, Genre Studies, periodicals. Bookmark the permalink. 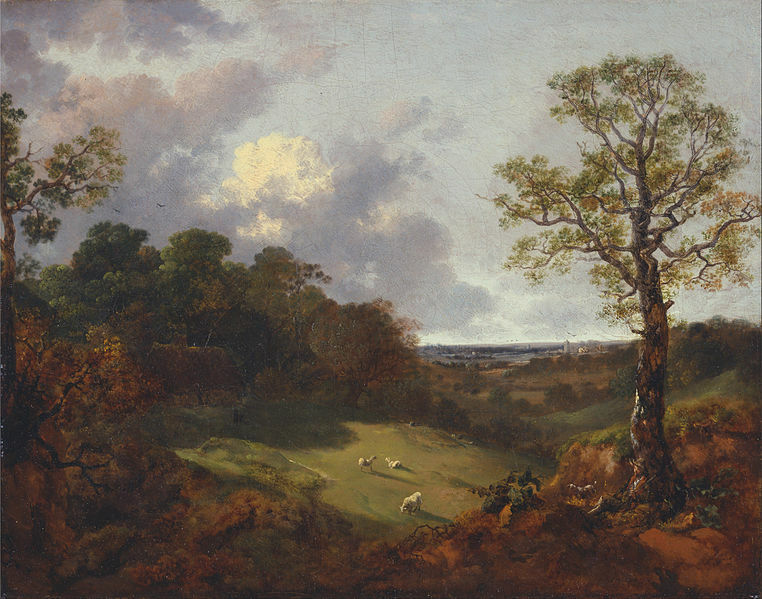 Jennie Batchelor is Professor of Eighteenth-Century Studies at the University of Kent. She works and publishes widely on the long eighteenth century focusing primarily on women’s writing, periodicals, representations of gender, work, sexuality and the body, material culture studies and the charity movement. Her most recent book, Women’s Work: Labour, Gender, Authorship, 1750-1830 (Manchester University Press, 2010) was issued in paperback in 2014. She is currently co-editing, with Manushag Powell (Purdue University) Women's Periodicals and Print Culture in Britain, 1690-1820s: The Long Eighteenth Century for Edinburgh University Press (forthcoming, 2017) and is writing a book on the Lady’s Magazine.